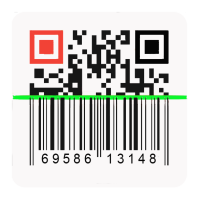 CnetSDK .NET Barcode Scanner SDK integrates highly accurate 2D barcode QR Code reader and scanner APIs into a standalone .NET barcode reader component/library dll. This .NET barcode reader component/library dll can be used to scan/decode/read 2D bar code QR Code from multiple image files in .NET, ASP.NET C# and VB.NET programming projects. On this page, .NET, C# & VB..NET programmers will learn how to scan/decode/read QR Code from image files. CnetSDK .NET barcode scanner library/component dll provides robust .NET 2d barcodes recognition APIs for developers to scan and read QR Code from image files, like reading qr code from Jpeg/Jpg, Png, Bmp, Gif, and Tiff raster image files. Moreover, if you have rotated Jpeg/Jpg, Jpeg/Jpg, Png, Bmp, Gif, and Tiff images and want to read and scan QR Code from the image, our .NET QR Code reader library/component dll can help you with this. To be more specific, images with 0, 90, 180, and 270 rotation degrees can be read and decoded by CnetSDK .NET Barcode Scanner & Reader SDK. Please note, the first data value of each decoded qr code will be CnetSDK* if you are using CnetSDK .NET Barcode Scanner SDK free trial dll for .NET application development. To get full qr scanner and reader features, you are required to order a license of our .NET barcode reader component/library dll. CnetSDK QR Code barcode reader library/component dll for .NET, ASP.NET C#/VB.NET allows developers to read and scan QR Code barcode from image files that be the forms of a Bitmap object, Stream object, and String. If you want to read QR Code from PDF document, please use CnetSDK .NET PDF barcode scanner library. For different .NET programming requirements, we provide .NET, ASP.NET, C#, VB.NET programmers with suitable QR Code scanning and recognition APIs. Please see situations as below and choose the suitable 2d barcode QR Code scanning APIs. Here, we provide three .NET examples for how to use .NET qr code reader component/library dll in upper situations. More related search words for CnetSDK .NET Barcode Scanner SDK: qr scanner .net, qr reader .net, asp.net qr code reader, c# qr code reader library, vb.net qr code scanner library, .net qr code reader component, .net qr code reader dll, scan qr code from image c#, read qr code from image vb.net, .net qr code decoder library, .net qr code decoder component, .net qr code recognition api, 2d barcode scanner .net, and 2d barcode reader .net.